I have recently been invited by We, The World and The Shift Network to speak about the work that Amma and her Organizations are doing to empower women. This talk will be part of the 11 Days of Global Unity Summit from September 11-21, 2016. The theme of the summit is from Vision to Action, and I am speaking on Day 7, the Day of Women. We will send you more information about this summit in the next weeks to come. It promises to be just amazing. In a time where each of us is called to be fully responsible for our collective future on this planet, we have in Amma a unique example of unleashing unprecedented power while operating fully from the feminine. Below is a blog post that was a Spotlight contribution to the REVEAL newsletter, but I wanted to re-post it here as a brief introduction leading up to my upcoming interview. As I have been called to start Peacelights, an organization based on the belief that peace is a responsibility, not just a right, and that each of us must do our part, I have been deeply influenced and inspired by the life and teachings of Sri Mata Amritanandamayi , the great spiritual teacher and world humanitarian affectionately known as Amma. I sat at Amma’s feet for the last twelve years, increasingly astonished by the blazing light of love that she shines on humanity. What many people don’t know is that while she hugs millions, she inspires and personally runs multi-million-dollar humanitarian efforts worldwide. Since 2006, I have had the privilege to be a representative at the United Nations for Amma’s humanitarian organization, the M. A. Math, and I am just beginning to see the depth and impact of her works. I can’t help but think that Amma has everything to do with all of our missions. In a time where each of us is called to be fully responsible for our collective future on this planet, as women especially we have in her a unique example of unleashing unprecedented power while operating fully from the feminine. I will not attempt here to discuss Amma’s spiritual nature and who she is. As her senior discipline Swami Dayamrita once said to me, discovering Amma’s true nature is a personal journey for every person who meets her. My intent is simply to share with you what I have learned from Amma, divine feminine embodied for some, off-the-charts woman spiritual leader and CEO for others. Now imagine this, the CEO of an organization telling her board of her new business plan: “I am going to go around the world and hug people, and in doing so I will start a hospital, build hundreds of thousands of houses for the poor, create several universities, orphanages, and schools, raise hundreds of millions of dollars and distribute them to the poor." What kind of response do you think this CEO will get? One of things I find amazing about the Amma model is how uniquely personal it is to her. She uses the simple repetitive gesture of a hug, the innocent uncensored expression of her nature, and from it activates multi-million-dollar humanitarian activities on a daily basis. I heard Amma once say that we should all aspire to become like Jesus not only pray to Jesus. What is the innocent expression of your true nature? As a child spontaneously having fun, what were you doing? When you first felt like you were on top of the world, what were you engaged in, what were you thinking, how were you moving, what was the physical expression of your light? Look for your innocent expression and begin to practice it – uncensored. You might be surprised by what you create and how much fun you have in the process. For us at Peacelights, working this process gave birth to Peacelights Connect, street happenings physically connecting strangers to each other with bungee cords, spontaneously creating bubbles of peace in our cities. 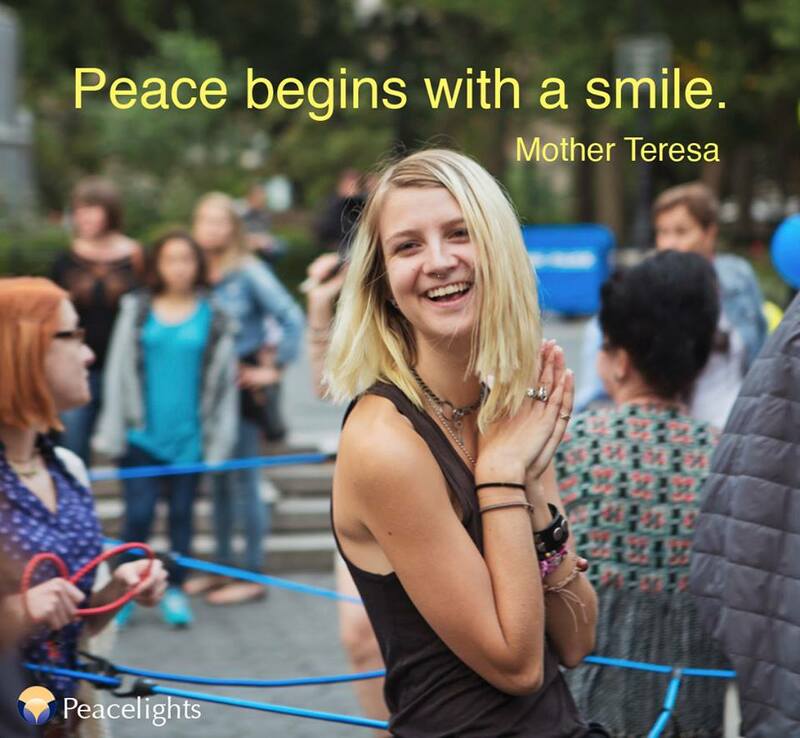 Peacelights is a movement of like-minded people who are committed to transforming the darkness of our world through a network of inter-connected lights – people just like you and me – that on their own can shine brightly but together can illuminate an entire world. 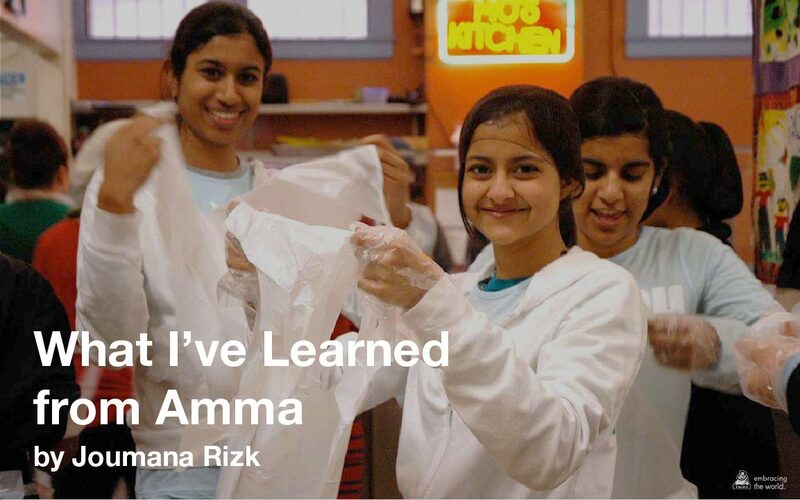 You might enjoy watching this short video of our Connect for Peace event in Beirut in October 2011 featuring Amma’s quote from the top of the post! Our next Connect for Peace event will be in New York City, so subscribe to our mailing list to stay updated on our upcoming events including the 11 Days of Global Unity Summit talk. Lebanon, a country the crossroads of conflict, can surely use Peacelights noble initiative of connecting one another in such unexpected way. We all need more great ideas into action like these! The darkness is so broad that even within races I believe that it has become important to bring peace between the rich and poor. Their worlds have become so divided and the misunderstandings so harmful. Thank you for the Light and direction. Each of us in our own way can really make a difference. There is no gratification greater than giving from the heart. What's a Peacelight to do?